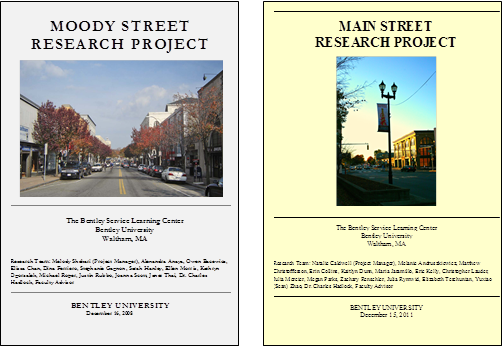 The page provides access to two Bentley University reports on the business climate in downtown Waltham, Massachusetts. This work was carried out under the auspices of the Bentley Service Learning Center and performed by teams of seniors in the Honors Program. For further information, feel free to contact the faculty advisor, Prof. Charles Hadlock, at 781-891-2178 or at chadlock@bentley.edu.